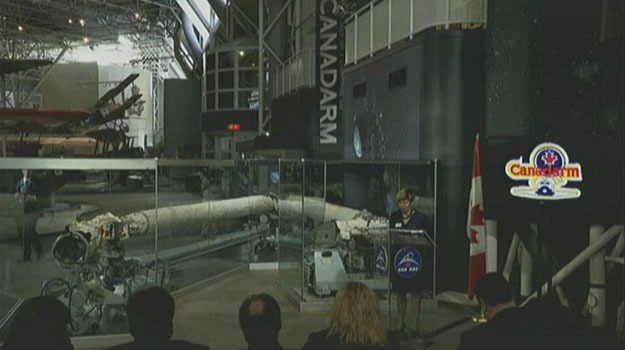 On May 2, the Honourable James Moore, Minister of Canadian Heritage and Official Languages, unveiled the permanent Canadarm display at the Canada Aviation and Space Museum. Canadian Space Agency Astronaut Chris Hadfield assisted in the inauguration of the exhibit from orbit as Commander of the International Space Station – a role made possible due in part to the contributions of the Canadarm. Although the CSA press release states that this arm travelled “624 million kilometres and logged a total of 944 workdays in space aboard the Space Shuttle Endeavour”, in fact this arm flew several missions on all of the shuttle orbiters. And the 624 million km refers to the distance flew by all the shuttles carry Canadarms. Several missions did not carry the robotic arm when it was deemed unnecessary for the mission. The first Shuttle RMS was known within NASA and the CSA as RMS 201. It flew on 23 flights and travelled 150 million km. The CSA created an interactive exhibit displaying the Canadarm, which allows visitors to navigate through the history of the robotic arm, including its greatest achievements and how its legacy continues to live on today in medical robots used in neurological and pediatric surgery. “We invite Canadians to see space history for themselves, and tell their children and grandchildren how proud they were to see Canada on the forefront of global innovation,” said Gilles Leclerc, Acting President of the CSA. In 2011, the Canadarm wrapped up 30 years of operations supporting the U.S. Space Shuttle Program. The CSA negotiated with NASA the return of this original shuttle robotic arm. Upon its return, the 15-metre arm was sent first to MacDonald, Dettwiler and Associates (MDA) in Brampton, for a thorough evaluation and preparation for its public display.